This is an In Person Signed Colour 10" x 8" Photo of the former Barcelona Footballer who made 79 Appearances for the Dutch National side. 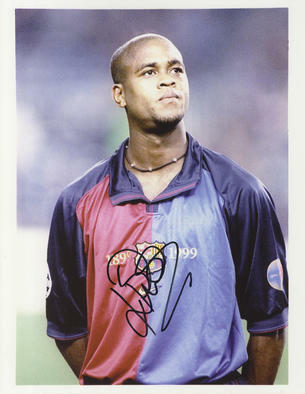 Patrick Stephan Kluivert ( born 1 July 1976) is a football coach and a former Dutch football player. As a player, he played as a striker for Ajax, Milan,FC Barcelona, Newcastle United, Valencia, PSV Eindhoven, and Lille. He is currently coaching the Curaçao national football team.